The New York Times describes Suits as The Devil Wears Prada of investment banking. It is an insider's perspective on Wall Street from an outsider's point of view, and a vibrant snapshot of an immigrant family with big dreams. USA Today and Texas Monthly top pick! "An intriguing...outsider's tale of lethal ambition." "Quite literally, I could not put this book down." "Her candid memoir is a must-read for anyone." "...told with alarming detail and considerable humilityit's a tale that will help the reader hone his or her ambition down to a finer, more human point." "This book about choices and their consequences is a gripping read." "heartwarming, heartbreaking, and hilarious in one great book. 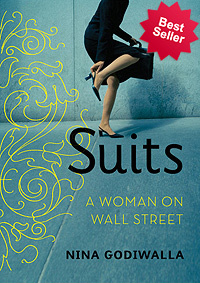 [Suits] is an absolute must-read." "Fresh, funny and utterly convincing. Nina Godiwalla has perfect pitch." Site design © & maintenance by xuni.com. All content © 2010-2019, Nina Godiwalla.